Cannibals and Carpet fitters is written by Richard Lee O’Donnell (End of the Road) and directed by James Bushe (Predator Dark Ages, VK) and is based on the award winning short film of the same name. It is currently doing the rounds on the festival circuit and has won a number of awards, including Best Feature at the Unrestricted View Film Festival and the London Horror Society award for directing. The film opens with two poor hapless campers, Jack (Alex Zane – Cain Hill, Rude Tube) and Gillian (Jessica-Jane Stafford – Redwood), lost in the woods in true horror film style. This part of the film is done as found footage and I thought here we go again. However, it soon reverts to traditional filming techniques and then things really start to get good. The title is pretty self explanatory, Nigel (Tony Nyland – TwentyFourSeven), the manager of Cupid Carpets has landed what he thinks is a great contract, refitting all the carpets in a huge and remote country house. With the help of his sulky daughter Jade (Laura Jean Marsh – Devotion, Pier Pressure) he gets his crack team of carpet fitters together and sends them out to the job. The first van contains Chris (Christopher Whitlow – Where I Belong) and Tasha (Zara Phythian – Kung Fu Darling). They get set up ready to start, but soon find out the whole thing is a trap, set by Mrs Hanning (Jenny Stokes -Holding On, Justice Squad) and her brood of crazy cannibal sons. Blissfully unaware they are walking into a trap, the next van isn’t far behind, with Colin (Darren Sean Enright – Allies, Blackout) , Dean (Richard Lee O’Donnell – He Who Dares) and apprentice Malcolm (Dominic Holmes – Splintered). These unassuming carpet fitters must now become reluctant heroes and try and get out of this mess alive. Cannibals is a really enjoyable watch with gore aplenty as well as plenty and fits well into the great British tradition of comedy horror. The acting performances are very good, especially “the boys”, Edward (Mingus Johnston – Schemers), Charlie (Phill Martin – Pan, Cain Hill), William (Lee Charles – I Am Soldier), Andrew (Darren Maffucci – Zombiehood) and Harry (Grant Steven – Sacrilege). A really great film, well worth watching if you get the chance and fingers crossed for news of a wider release in the near future. 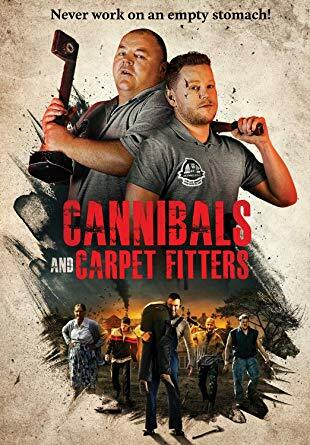 Cannibals and Carpet Fitters is available in the US Now. Coming soon to the UK soon.